Estimated global reserves of shale oil could increase total world crude resources by 11%, according to a US government report. The Energy Information Administration estimated there were some 345 billion barrels of "technically recoverable" shale oil reserves in 41 countries. And some 7,299 trillion cubic feet of shale gas reserves could boost natural gas resources by 47%, the EIA said. But technically recoverable reserves are not a guaranteed supply. They are an estimate of how much oil or gas could be extracted using the latest technology and they do not take into account economic viability. "The reserves are one thing, but the ability to scale up the production for those reserves is another thing, which is not as straightforward in many parts of the world as it has proved to be in the US," said Jan Stuart, head of energy research at Credit Suisse in New York. For instance, in Poland, which is believed to have much shale potential, several companies have given up shale drilling after early attempts indicated extraction would be difficult. Shale oil and gas reserves are expected to have a huge impact on the world's energy markets. A recent report by consultants PwC said that shale oil "has the potential to reshape the global economy, increasing energy security, independence and affordability in the long term". Last month the International Energy Agency (IEA) said that a steeper-than-expected rise in US shale oil reserves would mean the US would change from the world's leading importer of oil to a net exporter over the next five years. The Energy Information Administration (EIA) is the independent statistics arm of the US Department of Energy. 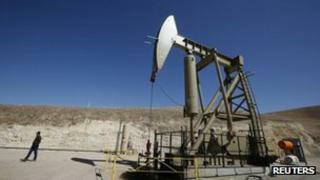 Its report marks the first time it has looked at global shale reserves. A previous report in 2011 only looked at shale oil resources in the US. According to its latest assessment, Russia has the most shale oil reserves with 75 billion barrels, ahead of the US and China. Is shale gas the GM of energy?